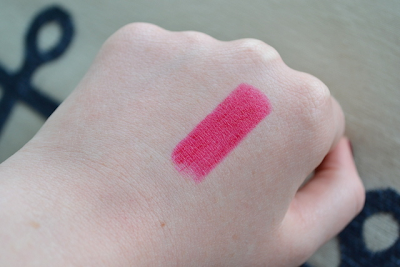 Helen Rambles On: Revlon Cherries In The Snow Lipstick - Reviewed! When it comes to the drugstore Revlon do some of my favourite lip products, i'm a big lover of the lip butters and balm stains but something I always forget that I love is their lipsticks. 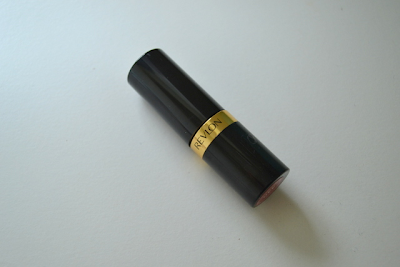 I especially love their Super Lustrous lipsticks as they are well pigmented, glossy and not drying on the lips. Today I have my newest addition to share with you and it's a bit of a classic. Cherries In The Snow is in fact one of Revlon's oldest shade and it has been around for decades. 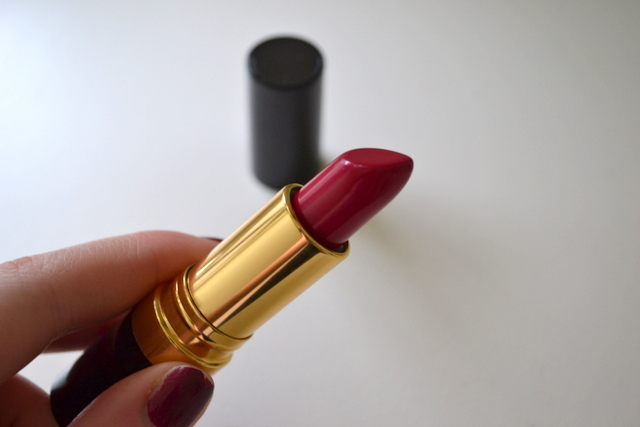 I love the packaging of these lipsticks as they look so vintage and reminds me of something I would have seen on my Gran's dressing table when I was little. I'm normally a plum girl when it comes to darker lipsticks in the colder months so this is definitely something different for me. The name suits it well as it is the perfect cherry pinky red shade. It is bright and bold but looks classy at the same time. The creamy formula can make it a little tricky to apply however once on it lasts very well. It almost leaves a stain on the lips and wears great throughout the day. Something that I love about darker lipsticks is the you can wear them bold or dab a little on with your finger to get a sheer stain. I also love applying a lip balm with a slight sheen to it underneath this to give an extra glossy finish. All in all this has become a firm favourite of mine, mainly due to the fact that you can wear it in so many different ways. I would definitely recommend checking out some of Revlon's lipsticks because they feel high end but without the eye watering price tag. There is also a nail polish called Cherries In The Snow which is also lovely; the two look lovely worn together. Revlon Super Lustrous Lipstick in Cherries In The Snow retails for £7.49 (Currently £2 off in Boots). 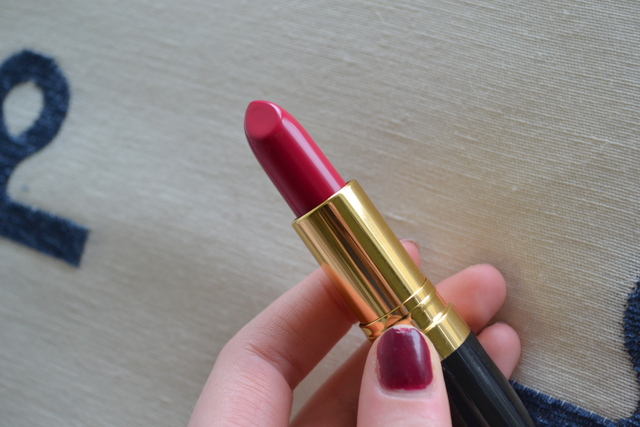 What is your favourite Revlon lipstick? ooooh this is really pretty! I really like Revlon lipsticks, even better when they have £2 off!